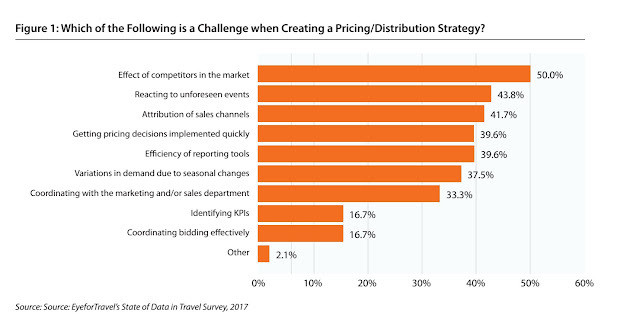 Revenue management is changing to become a more all-encompassing discipline according to EyeforTravel’s new Aggregating DataStreams for More Effective Revenue Management report, with 71% of managers believing that the discipline should be recognized as profit management. The report, which is free to download now, notes that a focus on profit will be key in the years to come, with the industry moving emphasis away from the traditional measures of success of Revenue Per Available Room (RevPAR) and Total Revenue Per Available Room (TRevPAR). Instead, the industry will look at guests in the round and consider the total profitability each can bring and aim to maximize this. The key metric the industry will use in the future Gross Operating Profit Per Available Room (GOPPAR) according to the report, which also notes that Cornell University found GOPPAR is now considered the most important benchmark for the future. Therefore, revenue managers will need to consider all revenue streams and also have a better understanding and inclusion of cost factors than they have in the past. Alongside traditional operating costs of the hotel, revenue managers will need to calculate and include their distribution costs, which the report also found to be a key area of concern for revenue managers. In order to achieve this revenue managers will need to increase their skillsets and also obtain better technology according to the report. It found that 71% of revenue managers felt that they didn’t yet have the tools to do their jobs effectively, making technology investment a major area for scrutiny in the next five years. Many of those featured in the report noted technology and automation is needed so that they could free up time to be spent on more important tasks, moving away from data collection and setting restrictions to working on overall strategy, coordination with other departments and guest experiences. This latter element is noted as being key in the report, particularly as guest reviews can have a direct effect on the property’s profitability. 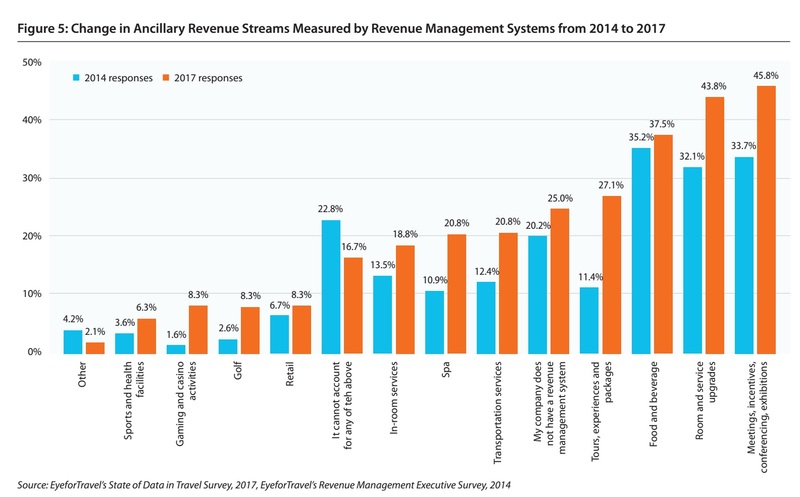 Measurement of ancillary revenue streams is up across the board according to the new Aggregating Data Streams for More Effective Revenue Management report from EyeforTravel, which is free to download now. As part of the report revenue managers were asked in both 2014 and 2017 “which of the following ancillary revenues can your revenue management system account for?” The findings show that in every single ancillary stream category measurement has risen and the number who reported that their system could not account for any ancillary revenues fell from 22.8% to 16.7%. In 2014, food and beverage was the most measured type of ancillary revenue but that has now been overtaken by room and service upgrades, at 43.8% of respondents, and Meetings, Incentives, Conferences & Exhibitions (MICE) at 45.8%. In both categories the percentage of systems measuring revenues increased by more than 10%. Even more dramatically, the measurement of tours, experiences and packages more than doubled, pointing to this revenue stream being recognized by hotel management as an important revenue stream and service for customers. Overall, every revenue stream was now being measured by revenue management systems to a greater degree than in 2014. The percentage of managers who reported that their system could not account for any of the revenue streams we asked about also fell from 22.8% to 16.7% of respondents, demonstrating substantial progress in monitoring and quantifying ancillary revenues. However, there was no type of ancillary reported as being measured by more than 50% of respondents, pointing to there still being some way to go. “It is encouraging that progress is being made but we would probably have expected it to be slightly faster than what we have found,” said Alex Hadwick, Head of Research at EyeforTravel. “We also asked revenue managers whether they felt they had the tools to do the job effectively and 71% said they did not, so it seems there are still technical and investment roadblocks. Removing these will be vital to hotels achieving their full potential revenue potential." 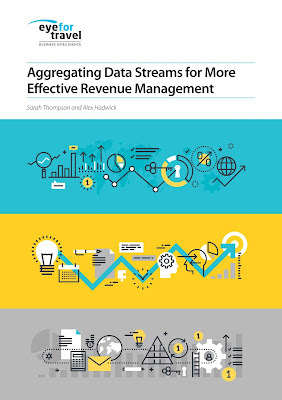 The effect of competitors is the biggest headache revenue managers face when creating their pricing and distribution strategies according to the new Aggregating Data Streams for More Effective Revenue Management report from EyeforTravel, which is free to download now. Exactly half of the revenue managers surveyed for the research find that their competitors create difficulties when trying to set their own pricing, noticeably ahead of any other category EyeforTravel asked about. Unforeseen events are the next most important challenge at 43.8% of respondents, followed by attribution of sales channel, which has come up as an issue across previous EyeforTravel research. The difficulty in measuring and predicting competition has only become harder over the last half decade as hotel comparison sites have widened the competitive pool and made product comparison easier for the consumer. Not only this but the rise of alternative accommodation sites have introduced a new stream of supply into many markets. So, what can revenue managers do to understand their competitors better and maximize their property’s performance in competitive markets? The report finds that revenue managers should build a comprehensive competitor set (compset) that looks at more than just proximity of other accommodation options. Instead, revenue managers should understand their own property’s attributes and the type of guests it attracts and build out to encompass rivals wo are fighting for the same customer. When it comes to setting the prices themselves the report urges caution in the part of revenue managers. The report notes that numerous studies have found that reducing prices in order to compete has long-term damaging effects for properties. Overall, properties that maintained higher average daily rates performed better, with the effects of cutting price not boosting occupancy enough to make up for the shortfall in income. Furthermore, consumers do not view prices rationally, with an accommodation purchase asking them to consider a complex matrix of factors. Indeed, a lower price may even indicate lower quality to some consumers that a property is if lower quality. Therefore, hotels need to consider the individual advantages that their property enjoys and only look at the very nearest competitors who are most likely to be vying for the same customer segments. If hotels are to try and win against their peers on price, then the report advises that hotels should not attempt to undercut the direct competition by more than 5%. If the customer is always right, then travel brands need to reach out to consumers where they are increasingly spending their time and attention – social media and messaging apps. Deploying chatbots on these channels can yield real rewards according to EyeforTravel and Travelaer’s new Are Bots Worth the Bother? report, which is free to download now. The top travel apps currently reach into the millions of users, with apps from Booking.com and TripAdvisor leading the way, however, the top social media and messaging apps pass the billion mark. Facebook Messenger currently claims more than 1.2 billion users. Not only this but usage of social media and messaging apps is estimated to have shot up by nearly 400% in 2016. Therefore, it is becoming a matter of necessity for travel brands to have a first-class social media strategy, of which chatbots should form a core element. The growth is opening up a whole new channel where customers can make direct bookings with travel brands, strengthening the link between brand and consumer and lowering distribution costs. Already brands such as Icelandair and French national rail operator’s digital arm Voyages-sncf.com, both of which feature as case studies in the report, have made thousand of bookings using bots on Facebook Messenger. However, the primary use for chatbots is for customer service requirements. As consumers conduct more travel research on mobile and have to manage complex itineraries through mobile, chatbots are well placed to help to consumers and drive loyalty through improved and much quicker interactions but travel brands are struggling to come to this realization, the report notes. Therefore, travel and tourism brands need to work harder to improve their chatbot services and their ability to respond to complex customer requirements. Doing so can help to alleviate the load on teams across a business and increase customer service levels. Indeed, it is critical for brands to focus on making chatbots work with, rather than replacing, humans says the report. With such a new technology most are using the system to help with the most common questions, such as luggage queries for Icelandair and room service questions in the case of Edwardian Hotels, both of which feature in the report. Icelandair note that currently the chatbots deal with just 10% to 15% of queries typically but this is expected to grow. How market conditions are creating an environment ripe for chatbots. How many chatbots are deployed with travel brands currently and what level of functionality they have. How they work, what tasks they can perform, and where their limits are. What the costs associated with a chatbot are and how it can help your brand save money. How chatbots can improve customer service. What effect they are currently having and will have on the travel industry. The good news for brands is that the cost of implementing a relatively simple chatbot is not a huge investment and is coming down as more providers move into the space and natural language processing becomes more sophisticated. The cost of implementing a bot typically ranges from EUR15,000 to EUR50,000 according to the report. “These aren’t a significant investment for an airline when they’re spending hundreds of thousands, if not millions, a year on other digital experience products,” says Mike Slone, chief experience officer at Travelaer. However, travel brands need a foundation of data and the resources to monitor, test and support the bot. Without this, there is potential for the bot to go astray. Data is key as brands first need to identify and understand what are the key pain points for customers first and seek to address these, rather than setting objectives beforehand. For luxury hotel brand Edwardian Hotels they began by creating apps for staff to record notes on guests, service rooms, check breakfast tables and monitor their work schedules. Icelandair started with their social media team and looked through what came up most frequently in their interactions. In both cases, these brands looked at what their customer-facing staff were being asked most by their customers and then sought to address these queries, freeing up time for their staff to focus on more complex tasks. Brands then need to monitor their bot and make sure that it is learning from each interaction in the right way. “The first version was built around understanding key words but had difficulties with the difference between: ‘what’s the luggage allowance for Europe?’ and ‘I lost my luggage in Europe.’ It’s a delicate situation to handle a bot telling the customer who has lost his luggage that the luggage allowance is two bags!” Said Guðmundur Guðnason, director of digital business development for Icelandair. The results speak for themselves as the brands in the report, which include Skyscanner and KLM, were able to drive bookings, boost ancillary sales and increase customer service. Customers have even been fooled into thinking they are talking to an actual person and leaving TripAdvisor reviews or cash tips for their artificial helpers! 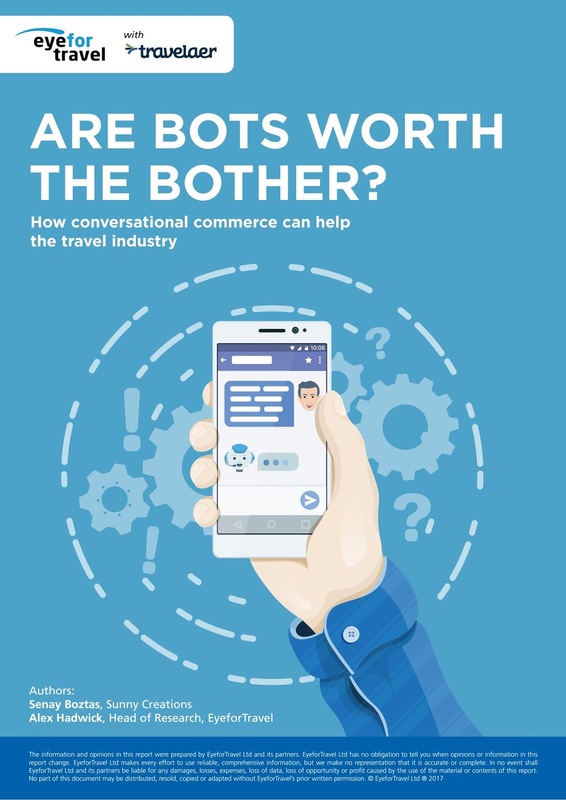 Chatbots are a potential route to billions of consumers but travel brands are failing to fully take advantage of their possibilities according to the new Are Bots Worth the Bother? Report for EyeforTravel and Travelaer. You can download the full report here. The report looked into how far travel brands have made use of Facebook Messenger to deliver customer service and booking to customer. It finds that while 93% of these airlines have a Facebook page, and 81% a Messenger link, only 38% of the 206 contacted responded to researchers’ messages, with a third of those contacted taking at least a week to reply. From the just over a third of airlines that responded through Facebook, most used generic messages pointing to their website or reservation team, but not necessarily including links or numbers. The report notes that airlines are not alone, with no vertical in the travel space yet to fully take advantage of this emerging and powerful technology. The report finds that brands need to move into this space as consumers are spending increasing time using social media and messenger services and are also gradually coming to expect to interact with brands over this medium as well. Moving onto these mediums can provider travel and tourism brands with a low cost booking channel and also ease the burden on customer service provisions according to the report. You candownload all seven of the reports and receive them straight to your inbox forfree by clicking here. · The State of Data and Analytics in the Travel Industry: What are the big trends, challenges and opportunities being created by data and analytics for the travel and tourism industry? EyeforTravel conducted a global, industry-wide survey of more than 450 travel data professionals to find out. · Understanding the Travel Consumer´s Path to Purchase: EyeforTravel and Jumpshot tracked more than a quarter of a million travel purchasers across five countries through clickstream data and consumer surveys to build a picture of the path to purchase. This white paper details the how, where and why of the decisions people make before they book, and what travel brands should be doing to capture market share. · Improving the Airline Experience: For passengers, booking and flying remains a process with many pain points. However, these represent opportunities for airlines, as by solving or easing these problems they can differentiate their services and avoid becoming just commodities in the eyes of consumers. With a major consumer survey and industry research, see how airlines can get a competitive edge in customer experience. · Aggregating Data Streams for More Effective Revenue Management: Revenue managers are facing a data overload: competitor analysis, channel production, distribution costs, booking information, customer data and much more. How can they know where to look, what to get out of their data and how to apply it? Help is at hand as this report will guide revenue managers in data collection, interpreting their findings and building strategies to increase profitability. · EyeforTravel Smart Travel Data Summit North America 2017 Round-up: EyeforTravel's Smart Travel Data Summit North America 2017, held in February 2017, saw the industry come together to engage in high-level discussions that would help attendees understand the trends and best practice surrounding data in travel. Across the two days speakers from top brands, such as Hilton, Delta, Accor, Wyndham and IHG, wrestled with the big issues and showed how their brands were creating value from data. · EyeforTravel Smart Travel Data Summit 2016 Round-up: EyeforTravel's Smart Travel Data Summit, held in November 2016 in Amsterdam, brought together the continent's top data analysts and scientists to discuss how the industry could better improve its approach to gathering, deploying, and using the vast amounts of information being created in the Digital Age. · Airport 3.0: The Technology and Data Transforming Airport Operations: The airport of the future will be customer-centric and data-driven with a ruthless focus on operational efficiency. This is being driven by passenger's smartphones, geolocation technology, cloud computing, and the insights being derived from all these technologies. Read this white paper to see what the innovators are doing to improve their airports and what opportunities are arising from increased customer access and cross-selling opportunities. So don't delay, download the Smart Travel Data Series now and get smart to the changes transforming our industry.